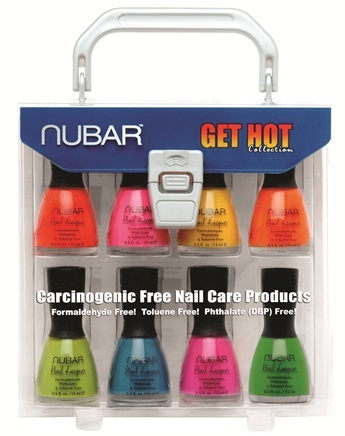 Use Nubar’s Get Hot Neon collection for summer-ready nails. Free of formaldehyde and toxins, this collection is available in eight shades: Hot Neon Green, Hot Orange, Hot Yellow, Hot Red, Hot Fuchsia, Hot Pink, Hot Lime, and Hot Blue. For more information, visit Nubar .